Thead of Nigeria’s elections on Saturday, February 16, the Murtala Muhammed Foundation (MMF) has disclosed that its 2019 Annual Lecture, would feature keynote addresses on credible and fair elections. 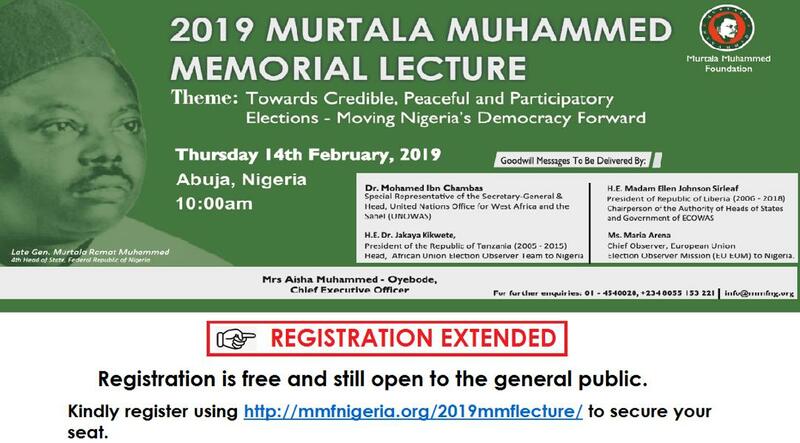 The annual lecture in memory of the former Head of State, Late General Murtala Muhammed, is scheduled to hold on Thursday, February 14, 2019 in Abuja with the duo of Prof. Chidi Odinkalu and Ms. Ayo Obe speaking on the theme: “Towards Credible, Peaceful and Participatory Elections: Moving Nigeria’s Democracy Forward”. Chief Executive Officer of MMF, Mrs Aisha Muhammed-Oyebode, in a statement, said the Emir of Kano, His HRH Muhammadu Sanusi II, will also present goodwill remarks at the event. Muhammed-Oyebode added that there would also be goodwill messages from representatives of key observer missions to Nigeria including: Dr. Mohammed Ibn Chambas, the Representative of the Secretary-General and Head of the United Nations Office for West Africa and the Sahel (UNOWAS); H.E Dr. Jakaya Kikwete, President of Tanzania (2005-2015) and Head of African Union Election Observer Team to Nigeria. Others are H.E Ellen Johnson Sirleaf, President of the Republic of Liberia (2006-2018) and Chairperson of the Authority of Heads of States and Governments of ECOWAS; and H.E Festus Mogae, former President of the Republic of Botswana and the Head of Joint IRI/NDI IEO Mission to Nigeria. “The gathering would be an opportunity to honour the memory of General Muhammed who on assumption of office in 1975 immediately instituted a Transition to Civil Rule programme which his successor in office, General Obasanjo followed through to fruition on October 1, 1979. She further urged interested members of the public to register on the website http://mmfnigeria.org/2019mmflecture/ to attend the one-day event holding in Abuja, the Federal Capital Territory (FCT). Obe, a legal practitioner, is a former President of the Civil Liberties Organisation (CLO) and also headed the Elections Program of the National Democratic Institute’s Nigeria office in Abuja. She is a member of several boards and projects and chairs the Board of Trustees of the Goree Institute (Senegal), serves as a Trustee of the Brussels-based International Crisis Group and sits on the board of the Dakar-based Open Society Initiative for West Africa (OSIWA). Odinkalu on his part, is a human rights activist, lawyer, professor and writer and was the former Chairman of Nigeria’s National Human Rights Commission and currently the senior team manager for the Africa Program of Open Society Justice Initiative.